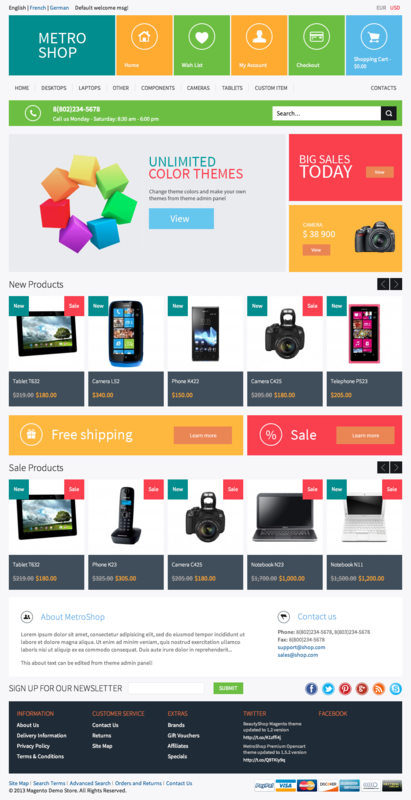 MetroShop – Responsive Magento theme! 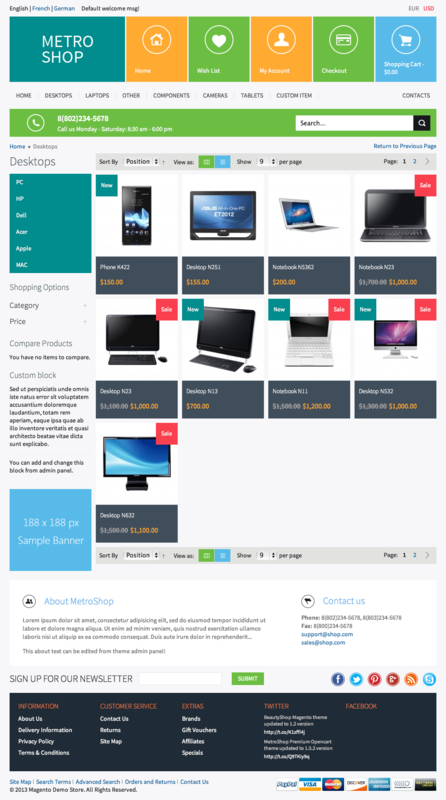 MetroShop – Premium Responsive Magento theme with powerful admin panel and unlimited colors! 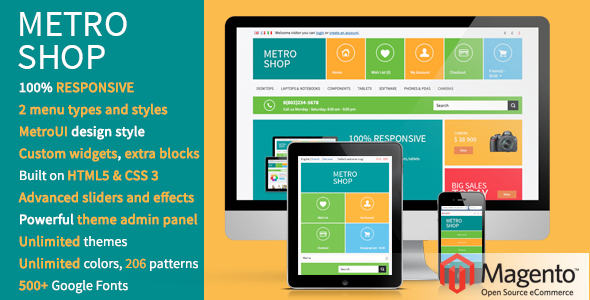 MetroShop is a universal 100% responsive Magento theme for any kind of shop with stylish MetroUI style design and powerful backend and it’s created with using the latest HTML5 and CSS3 features. Admin panel with easy navigation and dozens of configuration options allows you to change every thing in theme. You can manage colors of theme elements, select 500+ amazing fonts, apply 200+ pattern backgrounds and setup different theme settings and effects! Advanced slider mini banners and images for home page (see Demo site). All setuped from Admin panel. Product photos that you see in Demo shop just a sample and are not provided with theme. To upgrade your theme to newer version just add new and replaces changed files. This theme supports Magento Community Edition 1.8.x, 1.9.x, as there are NO modifications in core files. And we make sure it will work with any future Magento releases. If you like our theme please do not forget to rate it with stars in your Downloads section and write a review in Comments! Thank you! Please use our support system if you have any questions about theme, but make sure that you have read latest theme documentation. 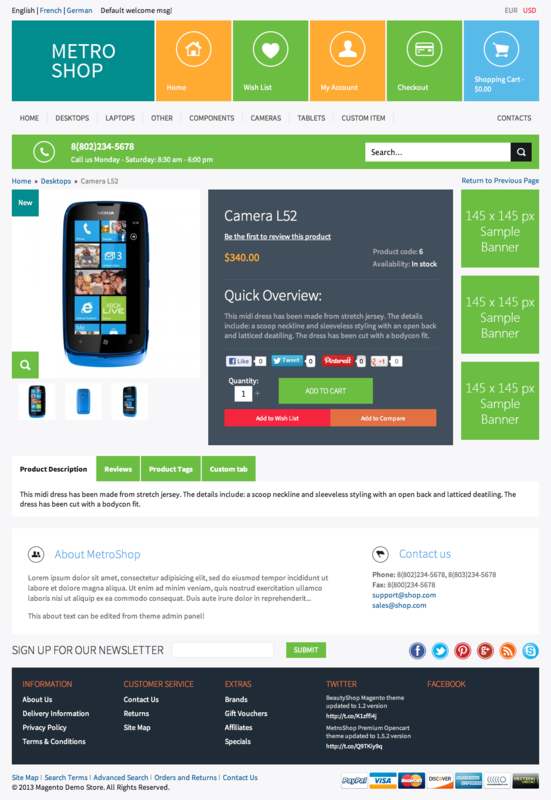 We provide Magento and theme installation service for extra cost.